We are engaged in offering laboratory spray dryer. We manufacture Lab Spray Dryer Systems which are used for applications viz. Pharma, Food / Agriculture, Chemicals, Herbal/Natural products, flavors/fragrances, dyes/pigments, agrochemicals/ pesticides etc.We have installations in industries as well as Pharmacy colleges, premier R&D Institutes, Labs & Universities. Evaporation capacity : 1.0 L/hr H2O max. Temperature of drying air: : 250°C ± 1°C accuracy. Heater capacity: : 2.5 KW. Compressed air for spray flow: : 2-5 bar. Pilot scale spray dryr are used for testing spray drying feasibility, producing customer samples, for developing optimum spray drying conditions and production of small powder batches. Umang offer a wide range of accessories to complete a lab or pilot scale system tailored to your requirements. 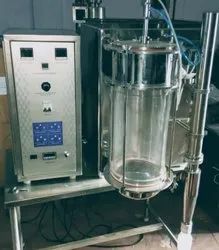 Our reputed entity is engaged in supplying laboratory spray dryer. Technical Specification shall be provided on request. Applications:• Calcium / Carbonators / Aluminum Chloride, Zeolite etc. • Misc. Polymers and Resins for allied Industries. • Milk, Milk derivatives, Soya Bean Products, Tea, Coffee, Instat Foods, Baby Foods, Weaning Foods, Egg Products, Chocolate etc. • Palm / Orange / Sandalwood / Ground Nut / Cod Lever Oil etc.